We Can Re-Do It: Crashing The Arm Party! I can't help, but be TOTALLY charmed by the Man Repeller. From the first time I read Leandra's site, I knew that my blog roll had just gotten way more fun. 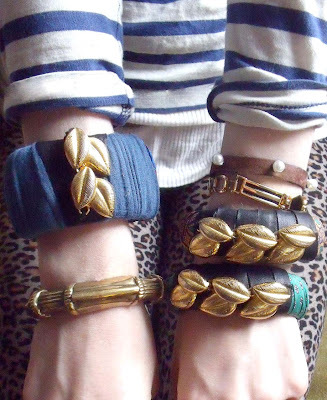 The more-is-more fashion philosophy , the hilarious photos and maybe my favorite of all, the "arm party"! If you are not familiar with her fantastic blog, I highly recommend it! She has an awkwardly endearing way of making serious fashion, seriously fun. 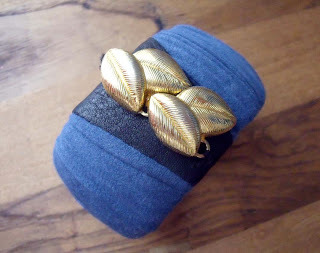 In true Man-Repeller spirit, I decided why make a single recycled bracelet project, when I could make an "arm party"?? 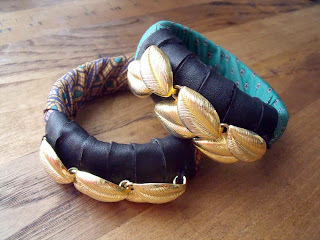 You can save some time in the beginning by preparing the scrap leather and the links from the necklace. 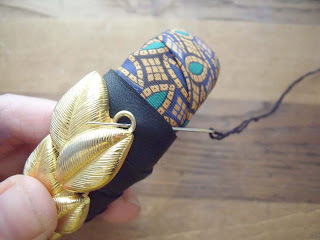 *For the leather, cut off a wedge from the end that is a little over twice the width of the larger bangle and about 2" wide, and cut it into a tallish triangular shape. What is left will be cut into two thin strips, preferably around 16" long to wrap around the two smaller bangles. 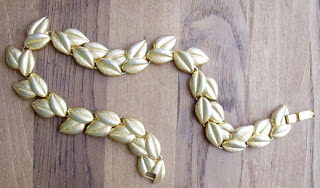 *For the necklace you'll need to decide how many links will go on each of the bangles. I chose for each of the smaller bangles to have three links and for the larger bangle to have two links. -To separate the pieces, insert needle nose pliers into a link and bend backward until it can slip it off of the piece it is connected to. -Use the pliers to bend the link back in to a closed position. 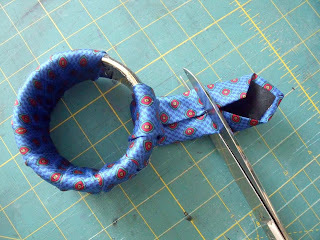 Step 1: Begin by anchoring one end of the tie to the bracelet by putting a little bit of glue on to the bangle's backside. Step 3: Anchor one end of the leather strip with glue and begin winding the rest around the bangle so there is a slight overlap. Keep the leather securely in place by adding a dabs of glue as you go. Step 4: When the leather band is the width you want, cut off any excess at the end and stitch into place on the bangle's backside. 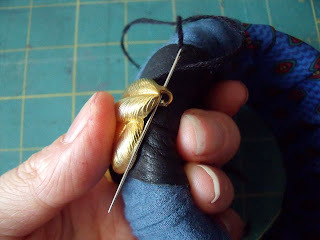 Step 5: Finish by sewing both ends of the necklace links securely down to the leather. 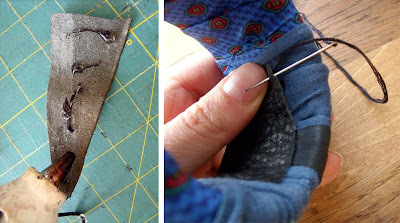 You can eliminate having any excess thread visible by inserting the needle under the leather for you first stitch. Repeat these same steps on the other small bangle. The process I followed for transforming the larger bangle was similar to the two smaller ones, but with a few additions. 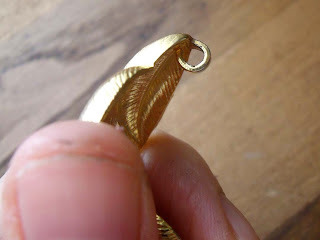 Also, I started by removing the brass plate on the top of the bracelet. This step wasn't a necessity, but because I was adding an extra layer of material, I wanted to reduce as much extra bulk as possible. 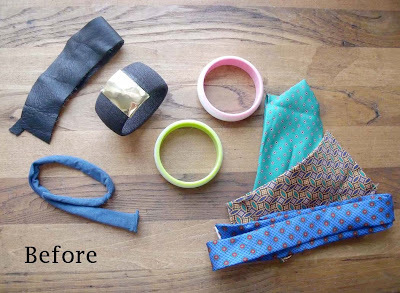 Step 1: Add hot glue to bangle and begin tightly wrapping the tie around it, adding extra glue to spots as you go to reinforce the fit. Step 2: Cut off extra material, leaving a tab about 2" long. Step 3: Fold in about half an inch to conceal the unfinished end and sew it securely (and flatly!) into place on the backside of the bangle. Step 4: Glue one end of the organic cotton to the bangle and begin tightly winding around the bangle. 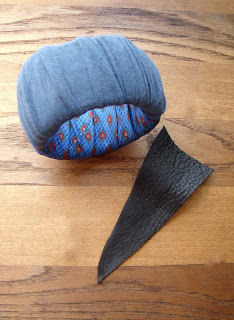 Finish by slipping the end under the last wound piece of fabric on the backside and securing with glue. Now you're ready to add the leather. 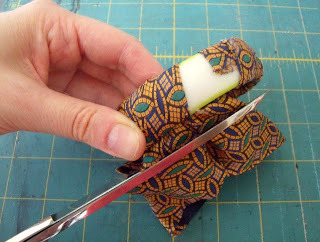 Step 5: Put a little hot glue on the back of the triangle and then place it in the center of the wrapped fabric. Pull both sides tight to have as flat a fit as possible and then sew the two overlapping ends together on the backside of the bangle. 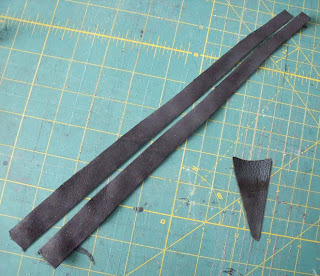 Step 6: Finish by sewing the two chain lengths together down the center of the leather. Thanks for the inspiration, Leandra!! great DIY! those bracelets are gorgeous! Thank you for your comment, Julieta! 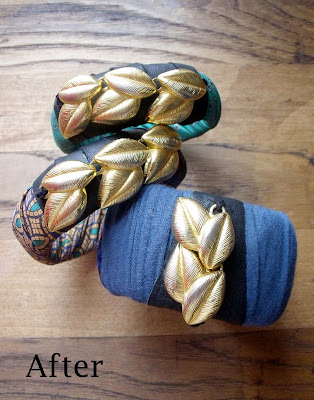 Fab project am now gonna be on the lookout for big bangles in the charity shops. Thanks for sharing. There are always so many of them!